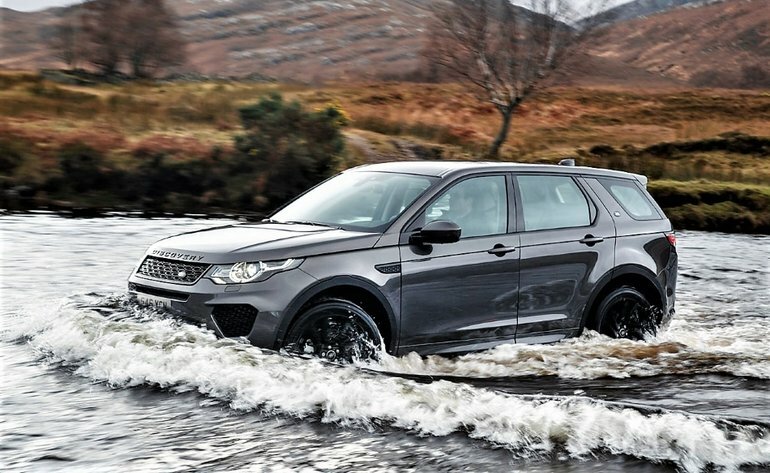 The Discovery Sport is already very popular in its compact luxury SUV segment, but that hasn’t held Land Rover back from making it even more competitive. In fact, it receives an all-new Ingenium engine for 2018, its 2.0-litre turbocharged direct-injected four-cylinder now designed and built totally in-house. Along with a similarly powered base engine to its predecessor, the SUV also gets the option of a much more powerful variant. Entry-level trims receive similar output numbers to their forebears at 237 horsepower compared to 240, and 251 lb-ft of torque instead of 250, while a class-leading adaptive shift program enhanced nine-speed automatic aids both performance and efficiency. Speaking of performance, top-tier Discovery Sport trims can be had with a 286 horsepower version of the same engine making 295 lb-ft of torque, allowing it to sprint from zero to 100km/h in just 6.7 seconds and topping out at 221 km/h, while the new base model achieves the feat in just 7.6 seconds compared to 8.2 seconds in the outgoing SUV (the seven-passenger Discovery Sport hits 100km/h in 7.9 seconds), and once again manages a terminal velocity of 200 km/h. The new engine features a higher-pressure fuel injection system with upgraded injectors, while the exhaust manifold is now integrated within the cylinder head for quicker warm-up and more immediate turbo response. The high-output variant also includes an upgraded turbocharger with unique bearings resulting in more power, quicker response and better overall efficiency. If you want the more potent engine you’ll first need to step up to HSE or HSE Luxury trim, which sport Dynamic exterior and interior styling plus equipment upgrades. Both trims get exterior modifications including a sportier front fascia design with deeper air intakes and other unique trim details all around the SUV, plus HID headlights with LED signatures, fog lamps, auto-dimming side mirrors with memory, and a fixed panoramic sunroof, while the cabins get a heatable sport steering wheel as well as driver’s seat memory, perforated leather upholstery, heated front seats, front parking sensors, a garage door opener, etcetera. Specific HSE Luxury features also include unique exterior trim, proximity keyless entry, illuminated aluminum treadplates, upgraded interior trim, an auto-dimming rearview mirror, navigation, 380-watt Meridian audio, higher grade perforated Windsor leather upholstery with contrast stitching and piping, a powered gesture liftgate, and more. Of note, the Discovery Sport is impressively equipped in base trim with features like off-road capable four-wheel drive boasting Terrain Response and All Terrain Progress Control, trailer stability assist, auto on/off headlamps, power-folding heatable side mirrors with approach lamps, an electromechanical parking brake, pushbutton ignition, a leather-wrapped steering wheel, rain-sensing wipers, a colour TFT multi-information display within the primary gauge cluster, dual-zone auto climate control, rear parking sensors, 8.0-inch touchscreen infotainment, a rearview camera, partial leather upholstery, 10-speaker audio, three USB ports with charging, Bluetooth phone connectivity with streaming audio, ambient interior lighting, and more. The Discovery Sport is the brand’s entry-level SUV and one of the more attractively priced vehicles in its luxury class at just $43,500 plus freight and fees, while the quickest Discovery Sport variant is available from $53,300. To find out more about the new 2018 Discovery Sport or take one for a test drive, contact Land Rover Vancouver by phone at (604) 738-5577 or drop by the showroom at 1730 Burrard St, Vancouver.